HAPILABS announced the launch of their Kickstarter crowdfunding campaign to raise funds for the manufacturing and distribution of HAPIfork – the world’s first connected fork that helps people monitor how much they eat. HAPIfork transforms people’s relationship with food as it monitors how fast the user is eating and helps them slow down. 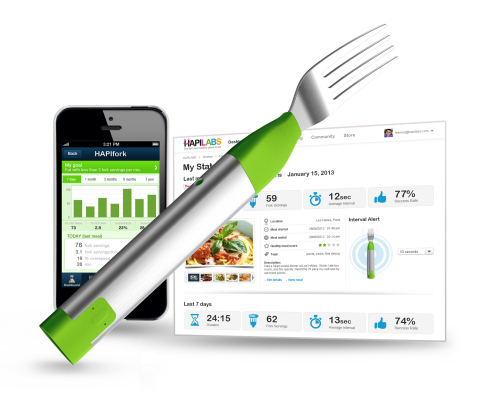 Unveiled at the Consumer Electronics Show (CES) in January, HAPIfork was selected among the finalists for the CES Innovations Award, Health & Wellness category. The word quickly spread in over 50 countries globally culminating in hundreds of articles, blog posts, tweets, television and radio appearances as well as a fun shout out from The Colbert Report. HAPIfork will be released in three colors (blue, green and pink) and will ship to Kickstarter funders first before the general public. HAPIfork comes with a color coordinated case making it easy to carry everywhere. The product will initially go on sale in the US and EU in the fourth quarter of this year. HAPILABS helps individuals in the 21st century take control of their HAPIness, health and fitness through applications and mobile connected devices. HAPIfork is part of suite of devices, applications and services from HAPILABS aimed at improving overall health, well being and happiness. Products in development include the HAPIwatch to help people sleep better and the HAPItrack to help people stay in great shape. Offering elegant and simple solutions, HAPILABS helps people achieve a healthier and happier lifestyle.